as some of my friends are aware, the return to the war after the most recent assault has been a little slower than normal. between familial emergencies, being swamped at the day-job and making a few lifestyle changes (not the least of which is beginning a gradual transition to a vegan lifestyle), my time has been somewhat limited. add to that, the lingering stresses of certain corners of my personal life, some of which have endured for years, have caused a certain amount of melancholy that has been a little difficult to get out of. sometimes stress can inspire. sometimes it just saps one of their will. the only thing one can do sometimes is hold up the shield and wait for the arrow storm to pass. that said, a new piece has been started. this one, while untitled so far, will be the second in the seneschal series and, as such, will be similar in mood and style. without revealing too much about it, the image was inspired, in a roundabout way, by some recent research i had done into the mayan underworld mythology, specifically the concept and notion of xibalba (the place of fear). while not an explicit depiction of xibalba, there is still a certain element of pilgrimage to it. that’s all i will say on the subject for now. i also have a couple of tattoo designs in the works, an ever-evolving idea relating to the gorgon, some sculptural ideas and a much-needed redux of edictvm I. one thing at a time for now, however. in other news, my hopes of attending and vending at this year’s necronomi-con in providence, rhode island came to an unfortunate end owing to timing and budgetary concerns. one more week would have made all the difference, alas. further, my other american exhibition prospect for this year seems to have fallen by the wayside as well, this time owing more to distance than anything else. nevertheless, i remain undaunted and am still working to put the rest of the year in order. i will post here as soon as i have more details. in the meantime, i wish the greatest of life, health and strength and a reminder that might, of mind and of spirit, is the greatest right. how you choose to interpret that is up to you, though how you manifest it determines your humanity. woe to the man who makes himself vile. shame upon the house of he who masks his vulgarity in the skin of humanity. those who know their wretchedness, acknowledge it and yet strive to rise above may one day earn their place amongst heroes. as some may have noted, my piece edictum I – duro in umbræ sancto has been taken down from the page. this has not been done as a result of legal pressure (i document all of my works sufficiently to ensure there is no legal doubt as to my ownership of my art). this was done as a result of dissatisfaction with the piece. edictum I was completed in a mad rush to meet a framing deadline for my first entrenchment show last august. i had a large, grand design for it and while it carries a certain amount of the sublime to it, i was never completely satisfied with it. the figure was nowhere near as expressive, when inked, as his pencil lines made him. the shadows were nowhere near as deep on him and the demonic figures in the background were not quite as subtly-defined as i had intended. in short, i compromised for the sake of time, and compromise is something i promised myself i would never, never do. for my punishment for this, as i am my own taskmaster and general in this war i wage, i will re-do the piece, making it more elaborate and hopefully more intense. if i am unsatisfied with it still, i will redo it again. if it takes years, edictum I will not be unleashed until i am completely satisfied with how it looks. i will commence the redraw as soon as my current work in progress, the auguries of grief. in the meantime, stay tuned for more info concerning upcoming shows. it’s going to be an exciting year. 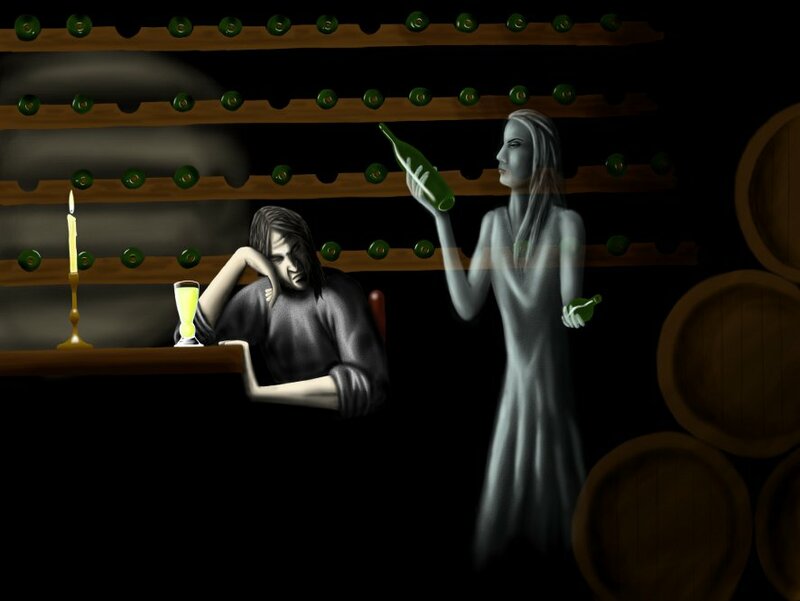 after several months of neglect following several hours of love-labour, i have finally completed one of my unfinished absinthe paintings, namely the cellars of mr. ferguson suffer the scrutiny of the late lady torsen.